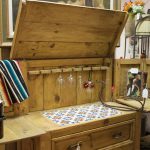 Posted April 25th, 2016 by Barb Stillman & filed under Exploring Arizona, Featured Shops. When my sister, Phyllis Cypert, moved to Phoenix from California two years ago, we decided it would be fun to explore Arizona together. Of course, we have the perfect destination planner right at our fingertips—The Antique Register—and getting out and visiting our advertising shops is one of the best parts of my job as publisher! It’s hard to believe how fast these past two years have flown by and how many places Phyllis and I have been able to visit—with many more adventures still waiting on our bucket list to be enjoyed. This trip, we headed north to Flagstaff for a busy day. Flagstaff has always been a fun destination for Phyllis and me going back to our childhood. On summer vacations, we would travel with our parents and siblings from California to Texas for family reunions and Flagstaff was our much anticipated oasis. Back then, we did not have air conditioned cars (I’m talking way back!) so we loved the cool mountain air after what seemed like eons, to us kids, of driving through the hot desert. I am sure my parents loved Flagstaff, too, since it gave them a much-needed break from their kids’ constant complaining, such as, “She’s touching me!” These days, we are just a couple of hours away and that lovely area in Northern Arizona is still an oasis on a hot summer day. We were bound for Flagstaff Antiques where owner Eric Stetson was waiting to greet us and show us around. Eric, fellow owner Charlie Myers, and dealer Pat Unsicker have a combined 50 years of experience in antiques and collectibles. There are four additional dealers so the shop has much to offer. Charlie and Eric had been business partners many years earlier and always loved the hunt for unique things. In 2014, they felt the time was right to open their own shop and found a great location in Sherwood Forest, a small shopping center located on Milton Road. Eric is well known for his extensive selection of books on the West, Southwest, Native Americans, firearms and more. Charlie has an outstanding collection of vintage advertising, highway signs and license plates. Other specialties include framed art, antique and contemporary furniture, Native American jewelry, pottery, rugs and Kachinas as well as country antiques and an eclectic mix of smalls and collectibles. The store has a front outdoor courtyard area used to display rustic yard art and furniture. That is where the photo on this issue’s front cover was taken, showing lots of color combined with a rustic look. Inside the shop, Phyllis and I especially liked an antique slot machine, gas pump and soda fountain among other fascinating items. She bought an antique dental pick to use for art projects and Eric told us that he sells quite a few of those and is surprised at their popularity. The shop is in the hub of activity—neighboring shops include Flagstaff Estate Sale next door (another fun shop), a clothing exchange store, a comic store and six restaurants. There are also close to fifteen other restaurants within a quarter mile. 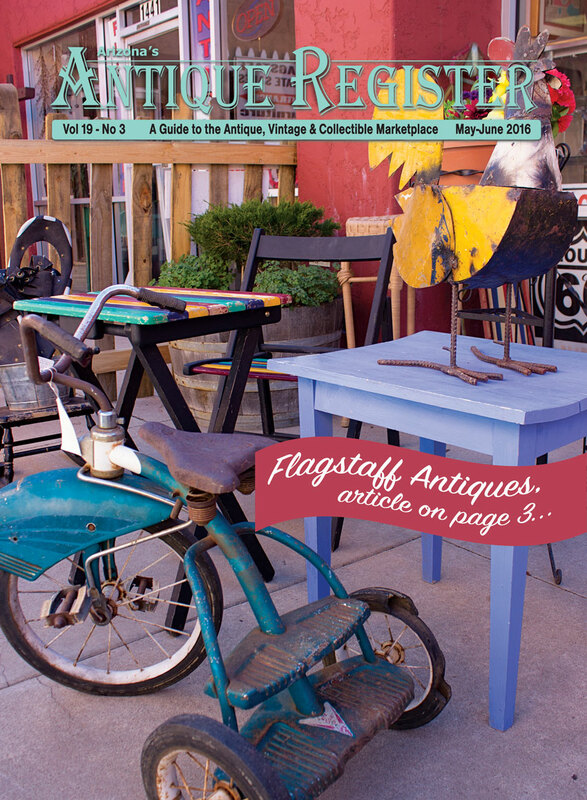 Located at 1431 S Milton Road, Flagstaff’s main drag, Flagstaff Antiques is easy to find. I-17 spills into Milton Road and it is easy to reach from I-40, too. Being located just a few blocks from Northern Arizona University and other central locations is ideal for students, visiting parents, tourists, traveling antique dealers and collectors of all kinds. 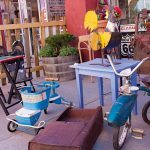 Flagstaff Antiques is open 10 a.m. to 5 p.m. seven days a week. For more information, call 928-779-2500, email esbks@infomagic.net or mtairman@infomagic.net or visit www.flagstaffantiques.net. We think it’s great when we get to tell you about a new shop opening up and we just love welcoming a new advertiser to The Antique Register! Jack’s Antique is opening on April 15 inside the Flagstaff Mall at 4650 N. Highway 89, in Suite G014. The owners are Jack and Vivian Delaporte and we wish them much success in their new venture! We can’t give you very much information about this new shop just yet, but Jack told us that his specialties include fine art, bronze sculptures, Americana and Victorian accent furniture. Also, Italian, French and American art glass, Limoges collectibles and much more! 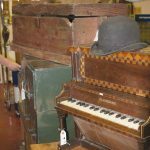 Jack’s Antique buys, trades and handles estate liquidations. The shop is also celebrating native Arizonan Harland Young (1924-2015), a painter and sculptor. Please stop by and welcome Jack and Vivian and check out their new shop. For information, call 928-526-0696 or email jack@jacksantique.com Their new website is coming soon at www.jacksantique.com. As Phyllis and I drove home, we talked about our favorite memories of the day and wished that we had more time to spend in Flagstaff exploring shops and soaking in the beautiful mountain scenery! Plan your own day or weekend trip to Flagstaff soon—shop owners are happy to recommend lodging, restaurants or local sites to visit while you are in their area. Take your copy of The Antique Register with you as you travel and be sure to tell the shop owners that we sent you their way.